These delightful cheesecakes will be the highlight of your next soiree. You will need 12 x 125ml metal or plastic dariole moulds. alternatively, use 8 x 150ml ramekins for slightly larger cheesecakes. allow an extra 4 hours to set cheesecakes. Grease moulds. To make biscuit layer, process biscuits in a food processor to fine crumbs. Add butter and process until combined. Divide biscuit mixture among moulds (about 1 tbs each). Using the base of another mould, press down firmly to compact. Refrigerate until needed. To make cheesecake layer, place 180ml (3/4 cup) cream and ginger in a small saucepan and bring almost to the boil over low heat. Meanwhile, soak gelatine in a bowl of cold water for 3 minutes to soften, then squeeze out excess water. Discard ginger from cream mixture, then stir in gelatine until dissolved. Cool for 10 minutes. Meanwhile, using an electric mixer, beat cream cheese, yoghurt and sugar on low speed until smooth, then beat in gelatine mixture until combined, scraping down the side of the bowl occasionally. In a clean bowl, whisk remaining 250ml (1 cup) cream to soft peaks, then fold into cream cheese mixture until just combined. Gently fold in half the Turkish delight. Divide mixture among the moulds, then refrigerate for 4 hours or until set. Preheat oven to 180C. 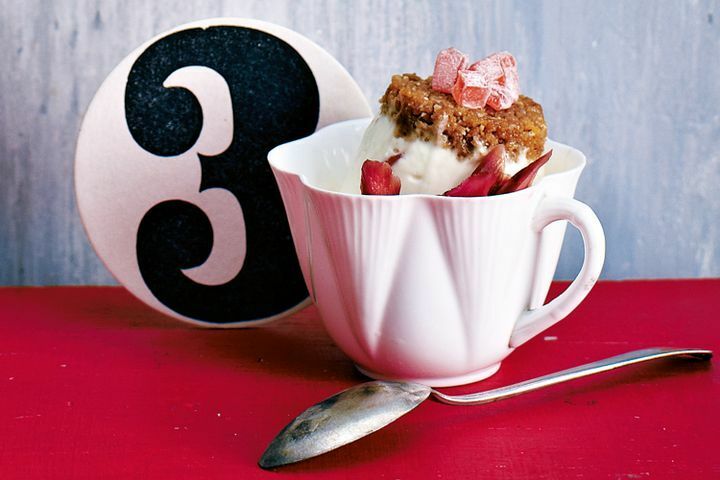 To make rhubarb, toss rhubarb with sugar in a small ovenproof dish, then drizzle over orange juice. Cover dish with foil, then bake for 30 minutes or until rhubarb is soft but still holds its shape. Cool, then refrigerate until needed. To serve, briefly dip moulds in a bowl of hot water, then run a knife around the inside of each mould to release cakes. Carefully invert onto plates or into cups. Top with remaining Turkish delight. Serve with rhubarb and syrup. * Titanium-strength gelatine leaves are from delis. If you prefer a slightly softer set for the banana cheesecake, omit the gelatine. * Turkish delight is from delis. We used pariya rose raahat. Its sticky consistency makes Turkish delight difficult to chop finely. to make it easier, dust a small area of a work surface with 2 tbs cornflour. Working with one piece of turkish delight at a time, cut into 4mm-thick slices. Turn slices to coat in cornflour, then cut slices into 4mm dice and lightly dust again. Repeat with remaining turkish delight, adding more cornflour as needed.